Healing Whiskers: What is a Therapy Rat? 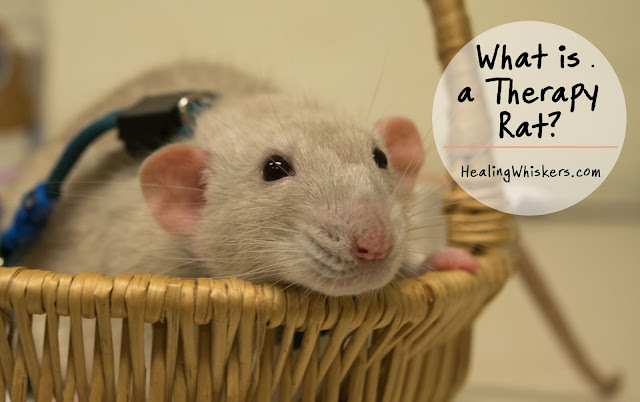 What is a Therapy Rat? So what exactly is a therapy rat? What do they do? Can you go anywhere you want with them? ESAs are emotional support animals and provide comfort to someone with psychological disabilities by just being there. They are not trained to perform a task except for comforting their handler and their handler alone. For example, someone might have a dog as an ESA for their anxiety or bipolar disorder. 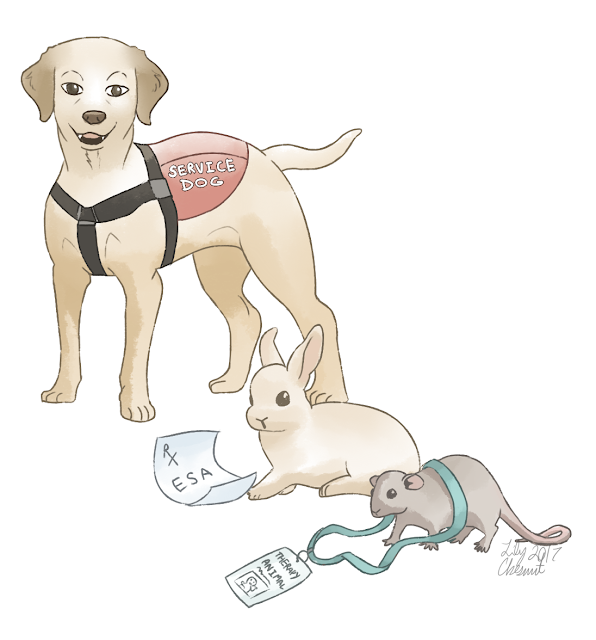 ESAs can be prescribed by a doctor but there are little to no regulation or real registering of these animals. There are no rules on what kind of animal can be an ESA and this has led to people bringing mini pigs and even chickens aboard planes. It's a real mess and for people who really benefit from emotional support animals, it can be very hard to be taken seriously. A therapy rat is just like a therapy dog, but with a rat! 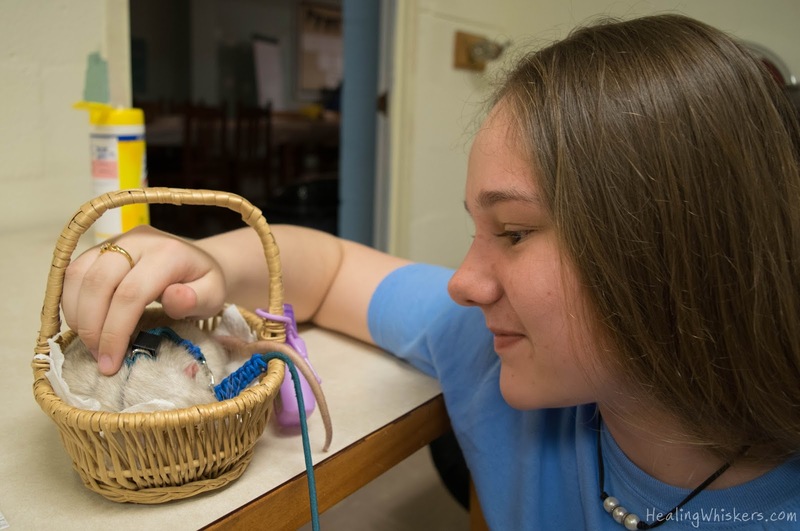 Therapy animals are invited to facilities for people to pet and love. This is therapeutic for many people and therapy animals are most often seen at hospitals, nursing homes, and colleges. These animals are trained to be tolerant of people of all types touching them in stressful environments. You typically only see dogs or cats, but with certain organizations it depends. Pet Partners registers dogs, cats, llamas, alpacas, horses, rabbits, rats, guinea pigs, miniature pigs, and birds! So yeah, therapy animals have to be invited into places. I am part of a local therapy group and I sign up for volunteer events to go to. We make sure we have our proper identification (a badge or printout of papers saying we are part of Pet Partners) and we should be good to go. Service animals are allowed anywhere their handler can go. ESAs are kind of in the middle - they are allowed on planes and allowed in housing areas where you are not supposed to have an animal. What kinds of working animals have you seen? Hello there! Congrats to you on being a finalist in the BlogPaws Nose-to-Nose awards! Wishing you all the best in May and many more blogging successes!